At the 2019 MLA Convention in Chicago, I presented my findings from a year long data collection project. Working with Peace Williamson, I transformed "The Black Short Story Dataset," into a one-page interactive chart that visualizes the most frequently republished black short stories from 1925 - 2017. The visualization highlights the seven most frequently anthologized short story writers or "The Big 7." What the "The Big 7 Visualization" doesn’t show, though, is the hours of labor that went into producing a short and concise document. There is a tendency to downplay human contributions to digital projects. 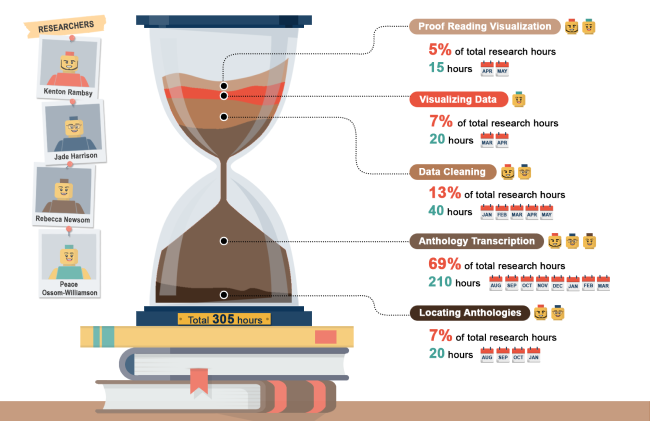 There is very little discussion about how much time it takes to engage in DH research. This project made one aspect of DH painstakingly clear: digital projects are labor intensive. This particular project took a total of 305 hours. A total of four people performed an assortment of tasks that contributed to its completion. Kukhyoung Kim, a graduate research assistant at UTA’s library of research data services transformed my hourly logs of this project into a visualization. This graph offers a visual interpretation concerning the labor associated with creating “The Big 7 Visualization.” Anthology transcriptions accounted for the majority of the labor associated with this project. More than just transcribing tables of contents, we created a spreadsheet of specific information related to the authors and publication histories of the stories and anthologies. If I had been working by myself, the time to transcribe the anthologies and perform other tasks would have taken much longer. I was fortunate to receive funding from UTA’s College of Liberal Arts iLASR grant to complete this project. Without funding, I would not have been able to hire graduate research assistants or use funds for a number of direct and indirect costs to complete this project. Ultimately, funding contributed greatly to my ability to complete a project of this sort in a year’s time.